In a rural outpatient cancer center affiliated with a nonprofit community hospital, cancer patients prescribed oral chemotherapy receive written and verbal education on the oral chemotherapy agent from the oncology nurse navigator. With patients self-administering oral chemotherapy at home, a gap exists in the current practice for the continual nursing assessment and follow-up of patients regarding symptom management and adherence. The review of evidence demonstrates the effectiveness of the utilization of tailored nurse coaching interventions in addition to patient education in improving symptom management and adherence for patients receiving oral chemotherapy. The nurse navigator recommended the development of a comprehensive patient-centered assessment and education protocol to enhance the education of patients/families/caregivers on oral chemotherapy agents. The nurse navigator also recommended the implementation of a tailored nurse-initiated follow-up telephone call protocol for the continual assessment of symptom management and adherence. As cited in the review of the literature, patient education is the cornerstone of oral chemotherapy. As educators, oncology nurses need to minimally provide patients information on the purpose of oral chemotherapy, the dose and schedule on how to take the medication, and safety. For the proposed practice change, the nurse navigator recommended enhancing the education of cancer patients/families/caregivers on oral chemotherapy by initiating the usage of the Multinational Association of Supportive Care in Cancer Oral Agent Teaching Tool (MOATT). Adherence to oral chemotherapy is influenced by a patient’s understanding of therapy and symptom management, the ability and desire of patients (motivation) to adhere to the regimen, and the adequacy of supervision/support by healthcare providers/nurses. The Reynolds’ Adherence Model cited in the study by Schneider, Adams, and Gosselin (2014) grouped adherence strategies into 1 of 3 categories: knowledge, behavior skills, and affective support. Affective support in the form of consistent follow-up and enhanced communication between patients and healthcare providers is a key component to improving patient adherence. Consistent follow-up and enhanced communication create opportunities for patients to ask questions and express concerns related to their medications and disease process, reinforces education, serves as reminders for medication administration, and facilitates motivational coaching, all of which serve to improve medication adherence. For the proposed practice change, the oncology nurse navigator contacted oral chemotherapy patients via telephone on a regular basis during the course of their treatment. 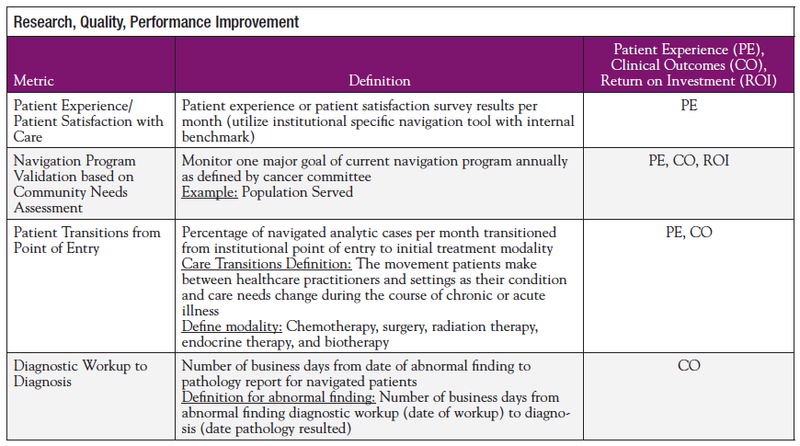 For the proposed practice change, the nurse navigator recommended enhancing the education of cancer patients/families/caregivers on oral chemotherapy by initiating the usage of MOATT, which provides a structured format to ensure all key areas of patient assessment and teaching are addressed, but also allows for patient-centered individualization of teaching and uses evidence-based tenets in patient education. Before the initiation of self-administering oral chemotherapy, patients and their families/caregivers met with the oncology nurse navigator for patient education. During the patient education session, the oncology nurse navigator provided information and education regarding oral chemotherapy using the 4 sections of MOATT. In the first section, the oncology nurse navigator used a series of questions to assess the patient’s knowledge of the treatment plan, current medications, and ability to obtain and administer the oral chemotherapy. In the second section of the tool, the oncology nurse navigator provided the patient/family/caregiver general patient instructions applicable to all oral chemotherapy agents such as storage, handling, and disposal; identified a patient-preferred individual system for remembering to take the oral chemotherapy (calendars, medication diaries, cellular phone alarm); and actions to take for various situations such as a missed dose. In the third section, the oncology nurse navigator provided agent-specific information such as dose and schedule, side effects, symptom management, and potential interactions (drug and food) by reviewing the patient’s medication list. In the fourth section of the tool, the oncology nurse navigator evaluated the patient’s/family’s/caregiver’s understanding of the information provided through a series of questions for teach-back. The tool provides an outline for patients/families/caregivers to ensure that assessment, symptom management, and strategies for adherence are addressed. The information gathered from the tool assessment and education was documented in the patient’s medical record and a copy of the completed tool provided to the patient as a reference. In addition to providing patients and families/caregivers with a copy of the completed MOATT, a reference card was created and provided to the patient containing the specific oral antineoplastic drug information. The card contains information regarding drug name (generic and trade), what the drug looks like, dose and schedule, how to store and handle the drug, potential side effects and management of side effects, precautions, drug and food interactions, and whom to contact with questions (names and phone numbers). Patients and families/caregivers were instructed to post the reference card on the refrigerator for easy accessibility. Patients and families/caregivers were instructed to take the reference card with them to the emergency department in the event of an emergency or adverse reaction. Patients receiving oral chemotherapy received a telephone call weekly for the first month of initiating treatment, twice monthly for the second and third months, and then monthly for the course of their treatment. During the telephone conversations, using the Adherence Starts with Knowledge 12 (ASK-12) tool, the oncology nurse navigator assessed barriers or facilitators to the patient’s adherence and addressed symptoms and side effects. The patient’s responses were used to identify and implement tailored specific adherence strategies to meet the patient’s individual needs. The follow-up calls, patient’s responses, and interventions will be documented in the patient’s electronic record. Subsequent follow-up telephone calls assisted in evaluating the implemented tailored interventions. Proactive nursing education and follow-up are critical with home-based oral chemotherapy. Oncology nurses can effectively reinforce patient education, review the patient’s medication schedule, monitor adherence, evaluate early side effects, and implement appropriate symptom management through telephone assessment and follow-up. With patients self-administering oral chemotherapy at home, a gap exists in the practice at the rural community cancer center for the continual nursing assessment and follow-up of patients regarding symptom management and adherence. The review of evidence presented demonstrates the effectiveness of the utilization of tailored nurse coaching interventions in addition to patient education in improving symptom management and adherence for oral chemotherapy patients. The nurse navigator implemented a comprehensive patient-centered assessment and education protocol to enhance the education of patients/families/caregivers on oral chemotherapy agents. The nurse navigator implemented a tailored nurse-initiated follow-up telephone call protocol for the continual assessment of symptom management and adherence. During the 3-month pilot project of the 2 protocols, 24 patients initiated oral chemotherapy. All 24 patients received patient-centered education, continual nursing assessment, and follow-up telephone calls to assess and promote symptom management and adherence. Based on the responses to structured questions and the ASK-12 tool, all patients reported that the education program, the individualized written information, and the follow-up telephone contact reinforced their knowledge and understanding of their oral chemotherapy as well as enhanced their comfort level in being able to manage and to adhere to their treatment. With a better understanding of their oral chemotherapy, patients feel more comfortable and confident to self-administer and adhere to their cancer treatment. Effective teaching and follow-up of the implemented performance improvement activity benefits cancer patients by improving side effect management, decreasing anxiety, promoting adherence, empowering patients to be included in their care, and improving quality of life. The diagnosis of cancer and cancer treatment are complex and extremely overwhelming for patients and their families. With the advancements in cancer treatment, more patients have and will have the opportunity to administer their own antineoplastic therapy at home in the form of oral chemotherapy/molecular/targeted agents. Patients and their families/caregivers must have informative and proper education on oral antineoplastic agents. They must be informed on the dosing, schedule, side effects, and management of side effects. As reported, education is a key factor to promote the proper use of oral agents for cancer treatment. Key strategies of education and enhanced healthcare provider–patient communication are necessary to ensure patient adherence to therapy. The goal is to ensure that patients know and understand their treatment and the importance of taking their medications as prescribed to improve symptom management and adherence to their therapy. As with any program, evidence-based metrics are essential to measuring success and sustainability. The AONN+ metrics were created for the domain of Research, Quality, and Performance Improvement (see table above). The authors remind all members of AONN+ to view the modules for the Research, Quality, and Performance Improvement domain on the website. The authors also encourage members of AONN+ to post items regarding the competencies and best practices for Research, Quality, and Performance Improvement on the AONN+ website discussion board.